Singapore Chow Mei Fun, although it includes Singapore in its name, does not originate from there. This dish is authentic Hong Kong cuisine. From Guangzhou to Hong Kong, from quaint street stalls to imposing hotels, you will find it on all the menus. Although all Chinese noodle dishes are delicious, Dry Fried Beef Ho Fun is probably the most popular. However, the Guangdong people are still very familiar with Singapore Chow Mei Fun. 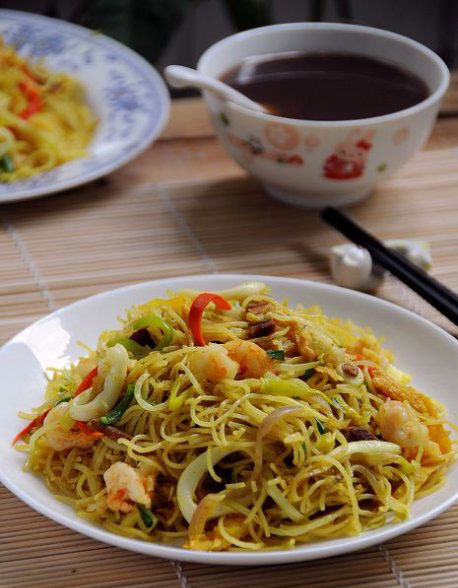 The special flavors of Singapore fried rice noodles: aromatic, a slight hot curry taste, and moderately salty combined with its rich color, make it a good option for mains or appetizers. The fast cooking also means it’s great for summertime, too! 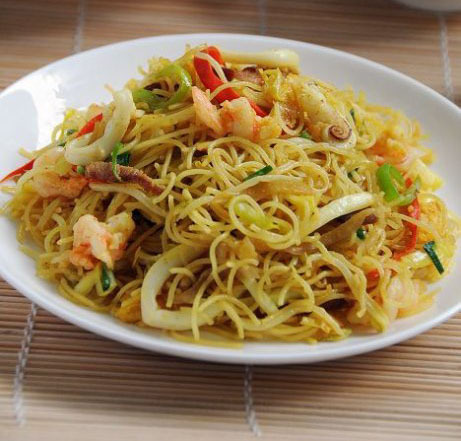 The two characteristic features of a good dish of Singapore Chow Mei Fun are rich ingredients, and a dry, non-greasy finished product. 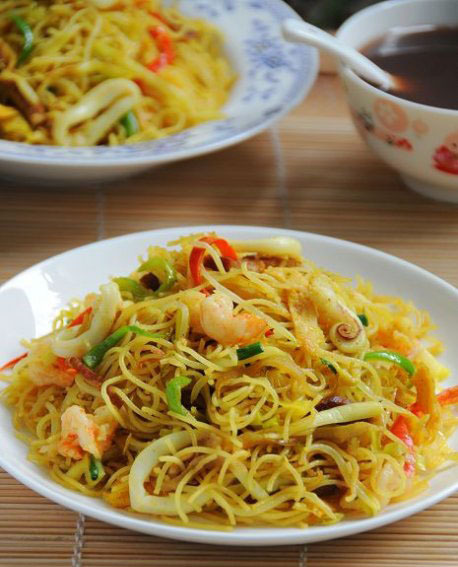 It is often said that the secret to delicious Singapore Chow Mei Fun is in the curry flavor and dry noodles (as opposed to greasy). To achieve these two features is not as easy as it sounds when making Singapore Chow Mei Fun and is just as challenging as Dry Fried Beef Ho Fun. If you add too much oil it will be greasy; not enough, and it will be too dry. 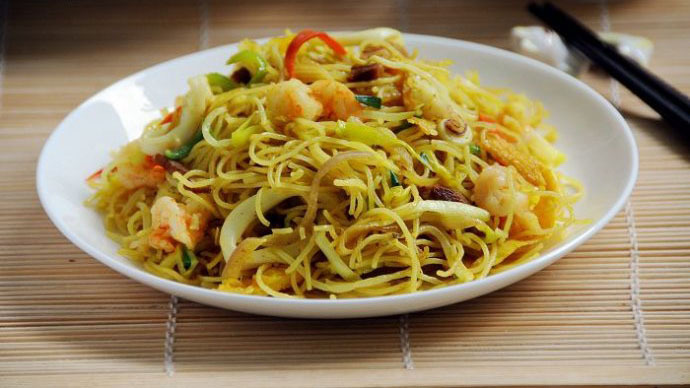 If it is fried for too long, the noodles break easily, and if fried too quickly, they will not soften. When you go to a restaurant to eat, even though different chefs might use the same ingredients and equipment, their expertise and mood affect the outcome. 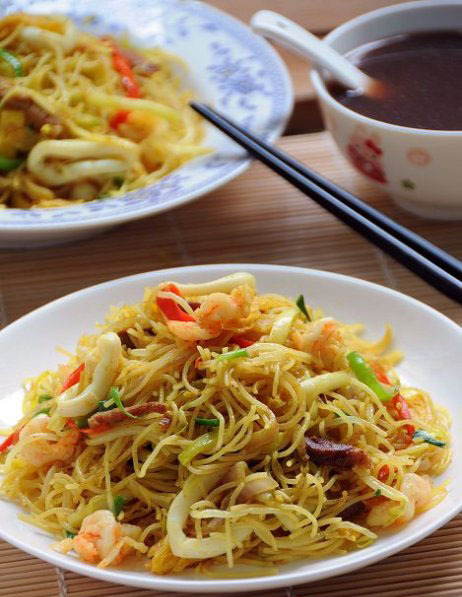 Singapore Chow Mei Fun will vary slightly in each restaurant, but all will have these basic ingredients: shrimp (or other seafood), barbecued pork, eggs, garlic chives and bean sprouts. I do not always use the same ingredients every time I make Singapore Chow Mei Fun. My home is not stocked like a hotel kitchen! So, the list of ingredients is not set in concrete with this dish, feel free to use whatever you like, according to your own tastes. 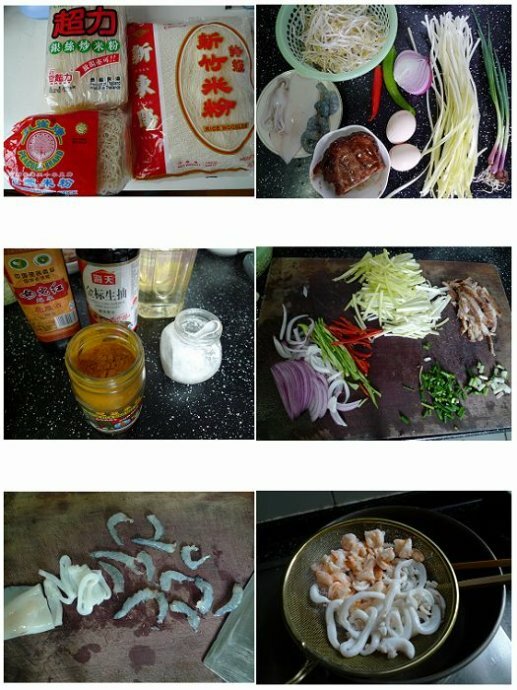 100 g bean sprouts, half a red onion, 100 g garlic chives, two eggs, 1 squid, a 50g piece of barbecued pork (sliced), 7-8 shrimp, 1 green and 1 red chili, two green onions. 4. 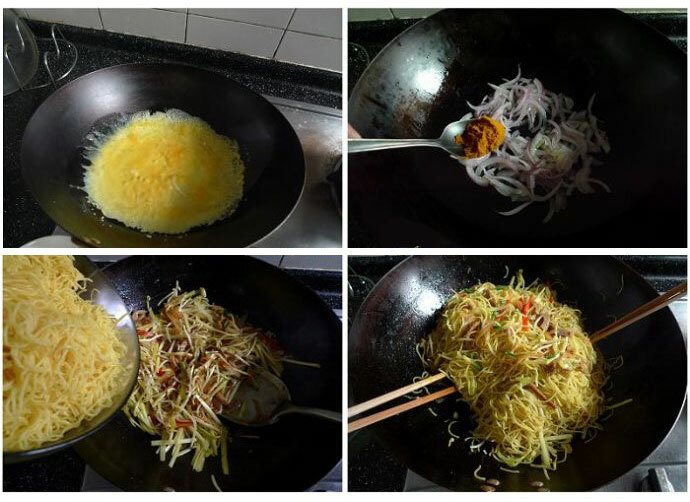 Cut the roots off the bean sprouts; shred or finely slice all other ingredients lengthwise; beat the eggs. 5. 1 whole squid body, sliced into circles. Cut the heads from the shrimp if you like, though you can leave them on. I prefer the shape of the cut shrimp better. 6. Fill the wok halfway with water and add the cooking wine and ginger. Heat to a boil and blanch the squid and shrimp only enough to change their color. Fish them out with a sieve and put aside until needed later in the cooking process. The first thing you need to do is cook and flavor the noodles with the curry. Fill a soup pot half way with water and add a tablespoon of curry powder and a teaspoon of oil. Bring to the boil. 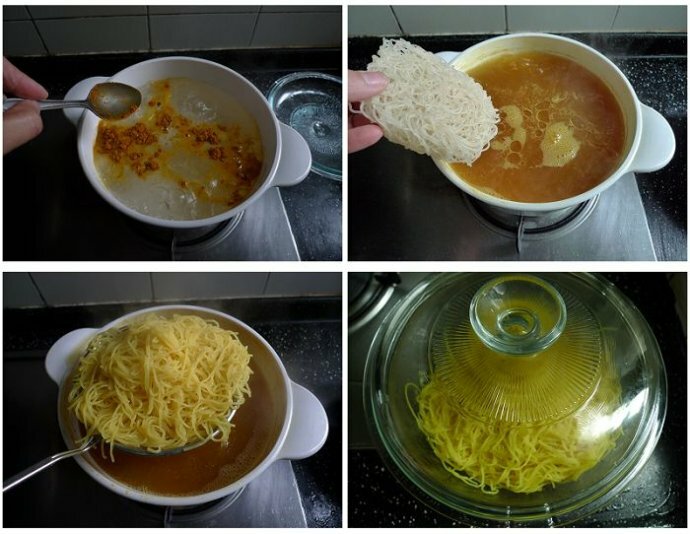 Carefully put the rice noodles into the boiling water, making sure the water does not splash. As soon as the noodles spread apart, take them out! Check out that golden yellow color! Drain the noodles, put them into a bowl and cover. Now to cook the other ingredients. After putting the noodles aside beat the eggs evenly with chopsticks. Add two tablespoons of peanut oil to the wok and pour in the eggs. Move the wok around, so the eggs coat the sides and don’t just sit at the bottom. This will ensure the eggs are cooked evenly all over. After two minutes, turn the egg over, and chop up the eggs with the spatula. Remove the eggs. Add a little more oil to the wok and saute the sliced onion with a teaspoon of curry powder until the onion is transparent. Add the chilis and barbecued pork and stir well. You can add the bean sprouts now or at the end (they will be crispier if added at the end), garlic chives and finally the rice noodles. In this step, do not shovel the noodles with a spatula. Toss quickly using two pairs of chopsticks so that you can distribute the individual ingredients better. Season with salt, and finally add the eggs back in. Sprinkle with chopped green onion. A good Singapore Chow Mei Fun must not be greasy nor too dry; moist but not mushy, and have the distinct taste of curry. 1. Rice noodles from Southeast Asia are best. Do not use Guilin rice noodles or Jiangxi rice noodles. 2. Different rice noodles require different cooking times. In my experience, Taiwan’s Hsinchu rice noodles take longer to cook than Dongguan rice noodles. This is important to realize otherwise you may end up over cooking some noodles causing them to go mushy. If the rice noodles are too long, you can cut them with kitchen scissors before cooking. 3. If you can’t get barbecued pork, you can use pork instead. 4. It is important to color the rice noodles with the curry powder. This process not only colors the noodles, but it is also more effective in distributing the curry flavor through the dish. If you just fried the curry powder, the flavor would not be as uniform.